ALOHA and welcome to our home at Luana Kai. Our unit is set apart from any other by the love we've put into it and the care we've taken to maintain it. Completely remodeled several years ago, our deluxe condo has tile floors throughout and stainless steel appliances for your use. There are ceiling fans in every room and tropical decor as well. No pets allowed. The complex is non smoking. The kitchen is fully-equipped with all the conveniences you might want. From toaster to coffee maker, blender to rice cooker, we've tried to think of everything. We even change out the spice rack every year so you'll always have fresh spices. In the evening, use the BBQ's by the pool, and then enjoy your meal on the lanai while watching the sunset! The condo has a king-size bed in the large master bedroom with en suite bathroom. There are two twins in the second bedroom with an additional full bathroom. We have a queen sofa-sleeper with top of the line 7' mattress. There is a full-size stack washer/dryer in the unit. The condo is perfect for a romantic getaway, a family vacation, or several friends just wanting some relaxation. Our 1075 square foot, ground floor unit has a garden and partial ocean view, with the ocean just beyond the grass. You can drive to sandy beaches in minutes or relax in the resort's pool and spa. The putting green, tennis courts, and shuffleboard are footsteps away. Pack light when you stay here, as we supply you with beach towels and chairs, boogie boards, coolers, and umbrellas. We've also ensured that you will have all your paper goods and laundry soap for your entire trip. When you come to Maui, we know that you probably won't totally unplug, so we have 2 TV's with digital cable boxes, We've also installed high speed WiFi for your convenience!! We offer discounts for long-term rentals, 30+ days. The complex is quiet, with palm trees, plumeria trees, and lush vegetation. It will remind you of 'Old Hawaii,' yet shopping and restaurants are just a short drive away. South Maui is the sunniest part of the Island, so come over, relax and enjoy our tropical island paradise! You can book with confidence when you stay in our condo, as we've been owners on Maui for 17 years and maintain personal contact with all of our guests. To that end, we respectfully request that you contact us via email or phone to let us know a little about yourself, when you're interested in going to Maui, and any questions you might have. That way we will have some communication before confirming a booking. You can contact us directly at 310-230-7711. We work with each guest in order to accommodate your flight times and vacation dates. Please read our Rental Agreement, Terms & Conditions, Cancellation Policy, and House Rules to confirm that our condo meets your needs. In order to do that, you'll need to click on Request to Book. then enter your Contact Information. Scroll down and click Continue. Under Rules and Policies, you'll see Rental Agreement in blue at the bottom of the page. Click the document to view it. If everything suits, then please go back to the Home Page and click Ask Owner a Question to contact us directly regarding availability and to find out more about the condo. We look forward to hearing from you. We enjoyed staying at this lovely condo. Everything was very well taken care of and it's a great location. Fiona was great, and Jill had lots of suggestions for things to do, places to eat, etc. Thank you! We were guests this Jan-Feb and couldn't have been more pleased with the condo. It was wonderfully renovated and came equipped with all of the conveniences of home. It is centrally located and is within easy access to beaches, grocery stores and restaurants. We especially enjoyed the easy access to the pool and the beach . Jill and Brian were gracious hosts and were very accommodating with our late check out request. We would definitely book again. It was our pleasure to have your family stay with us. I know your children enjoyed the pool and I'm sure you all created lasting memories. If your travels take you back to Maui, I hope you'll stay with us again. We travelled with another couple and were lucky to have found this condo. Aptly described as the best condo in Maui. The owner Jill was fantastic to deal with. Prompt response to everything, very helpful and genuinely cared about the quality of your stay. 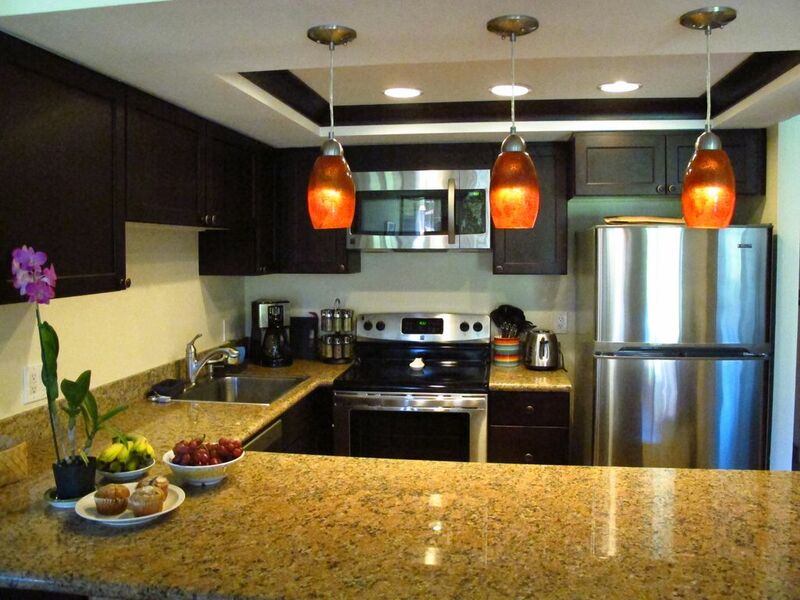 The condo is perfectly located in Maui allowing good access for all travel. It is perfectly located in the complex, ground level and close to the pool and BBQ but not so close as to be noisy. Parking was very accessible to the unit and never a problem finding a stall. We have stayed at VRBO rentals in many different locations and this total experience was the best. We would stay here again in a heartbeat for when we next return to the best place on the planet. You are so right that Luana Kai feels like community. We felt it right away too, which is why we bought the condo 18 years ago. We love it just as much today as we did back then, and it makes us so happy to be able to share it with lovely folks such as yourselves. Definitely come back and stay with us again! The condo is very spacious and had everything we needed (even ziplock bags)! The ground floor location was perfect for letting our girls run around the lawn while we made or ate breakfast. The beds were very comfortable and kitchen served us well when we wanted to eat in. It is so close to Ululani's Shave ice and the Huli Huli truck (Wed, Sat) that we had to enjoy each more than once! We ate at Sugar Beach Bakery on the last day and wish we had tried it earlier. My husband loved the Musubi! The condo's location on the island makes a drive to Lahaina, Wailea or Paia very easy but is far enough removed from the large resorts and crowded Kihei center to be very relaxing! The only downside was lack of AC but there were plenty of portable fans and ceiling fans to use. We used the beach chairs, sand toys, boogie board, beach towels and clothes drying rack. We weren't lacking anything! Thank you Jill and Brian! What a glowing review from a great family! I'm glad you found all the toys and supplies, and were able to use them during your entire stay. We, too, love the Huli Huli truck; we really enjoy having a picnic right there.Thank you for staying with us to celebrate your husband's birthday!! Communicating with you was so easy right from the start. I'm glad you were able to stay with us in Kihei as you explored different parts of the island. Mahalo for being such nice guests. Of course we had to find the pickle ball courts first, above all else! We loved having you stay with us and really enjoyed all the back and forth emails. Come back soon; a new coffee pot awaits. Rates are subject to change until reservation is confirmed. Taxes, cleaning fee and damage deposit are not included in the instant quote. Please contact owner for details.